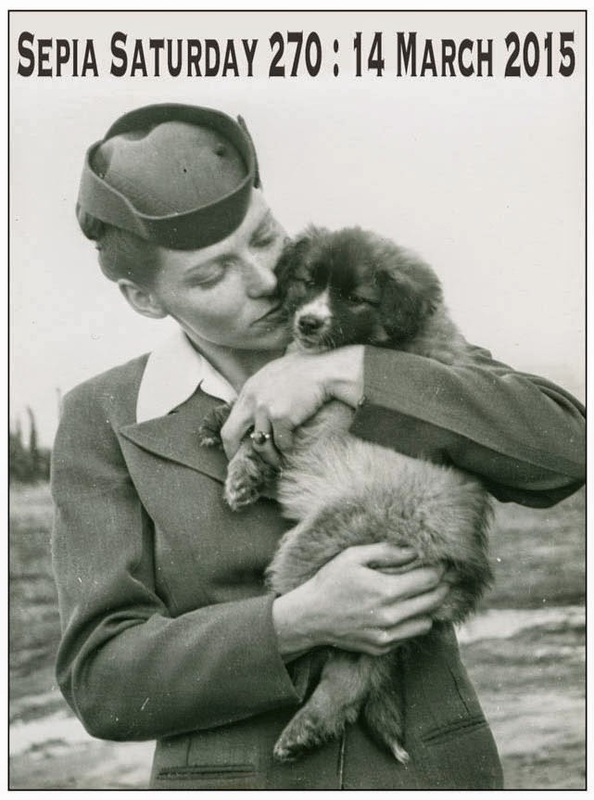 Our trawl through the various on-line archives available via the Flickr Commons initiative has already taken us to some fairly esoteric places, and this week is no exception for we are off to St Petersburg via Geneva. 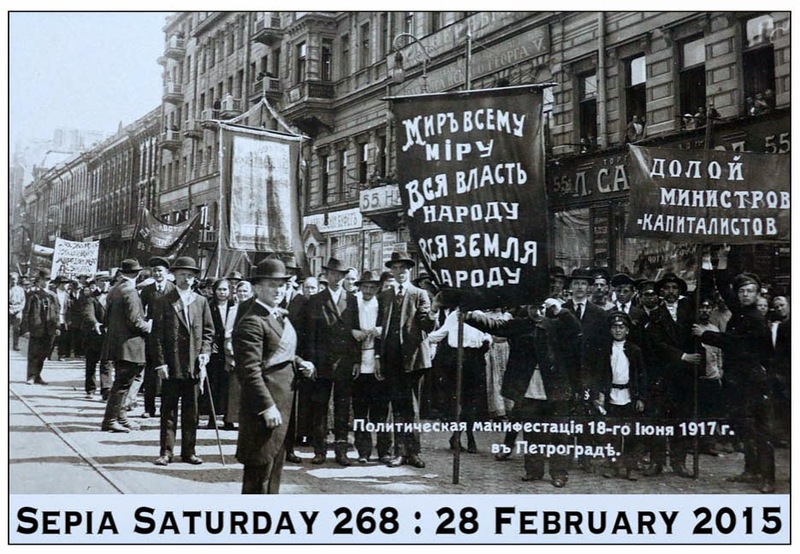 The photograph is in fact a 1917 postcard depicting a political demonstration on Nevsky Prospect in Petrograd, Russia, and as students of Russian history will know, this was right in the middle of the Russian revolution. 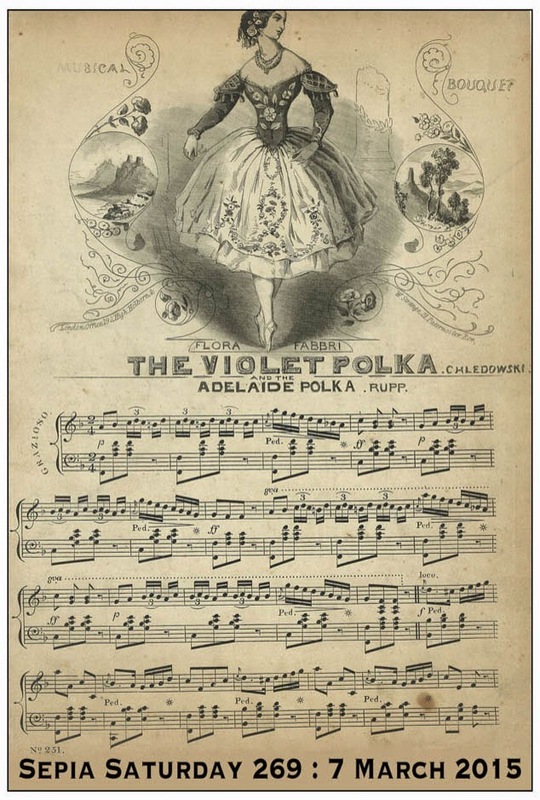 The image comes from the Kathryn & Shelby Cullom Davis Library of the Graduate Institute of Geneva. For those in search of a theme there are, as always, plenty of options: parades, banners, and gatherings spring to mind and for those in search of a more revolutionary approach, there is always revolutions. All you need do is to post a post on or around Saturday 28th February 2015 and link it to the list below. Before you start marching off into the brave new sepia dawn, just a quick reminder to visit the Sepia Saturday Magazine on Flipboard to see all your Sepia Saturday posts in a bright new format. But all that is for the future, for the moment let us rejoin the demonstration. All together now: "What do we want? Sepia Images. When do we want them? 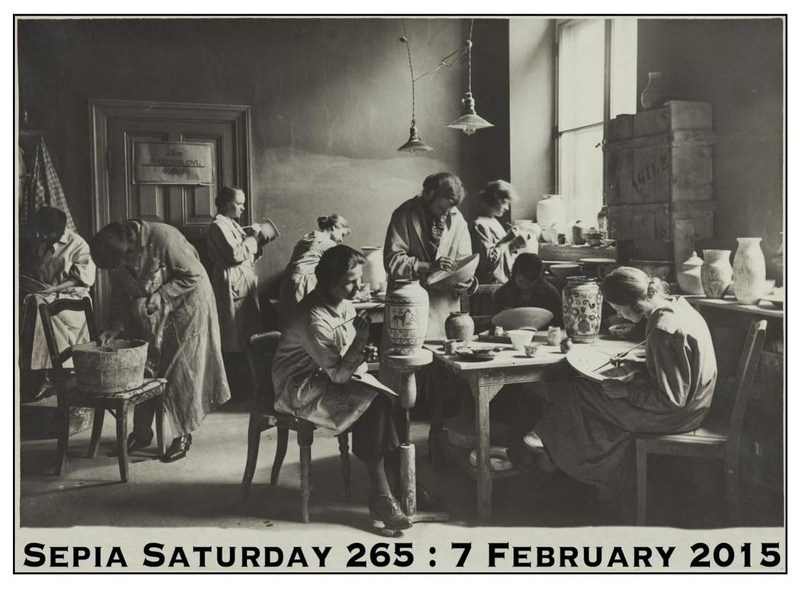 Now"
Our tour of the world's photographic archives has become a newsworthy event: this week on Sepia Saturday our theme image is being reported on the radio. To be precise it is on Finnish Radio - or rather Finnish Radio is on it. This 1937 photograph from the archives of the Finnish Radio Company shows engineers on the roof of an outside broadcast van. For those looking for a theme there is radio, broadcasting, roofs or people doing unusual things on motor vehicles. You might also like to run with the little and large comparison suggested by the two vehicles alongside each other. Whatever you decide to post, all you have to do is to post it, on or about Saturday 21st February and add a link to the list below. As we have a few moments before the next programme is due to start, why not take a look at the theme images for the next couple of weeks. Before the next programme gets under way, here is a short non-commercial break. 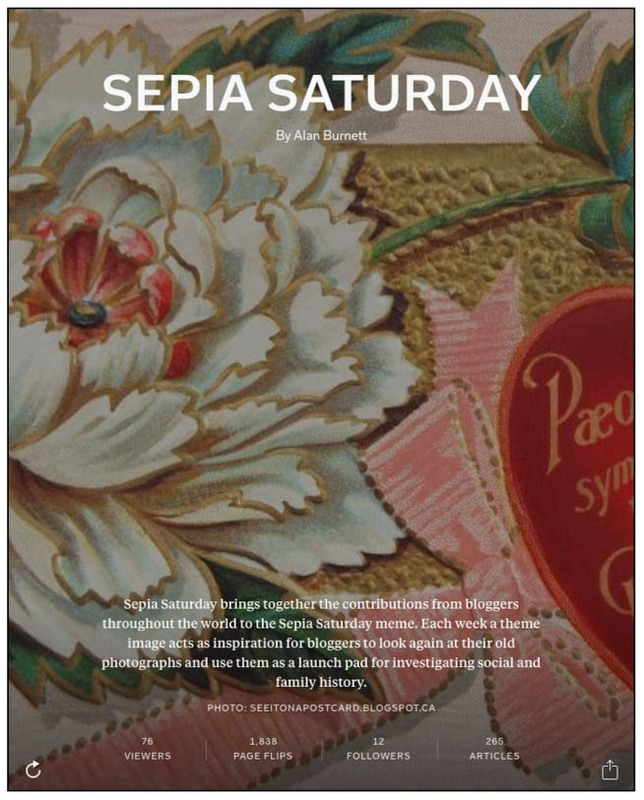 Why not get the Sepia Saturday Magazine - the on-line Flipboard magazine that contains all of our Sepia Saturday posts. Flipboard is available on smartphones, tablets - and now - PC's and iMacs: and it is free of charge. You can find Sepia Saturday either by searching for the magazine or by following this link for the desktop version. Sepia Saturday Magazine - you know it makes sepia sense. Sepia Saturday 266 just happens to coincide with Valentine's Day so our theme image this week is a Valentine's Card which dates back to the 1940s and comes from the Flickr Commons collection of the Deseronto Archives (and as we have not visited these archives before on our tour of Flickr Commons participants, we can now tick them off). 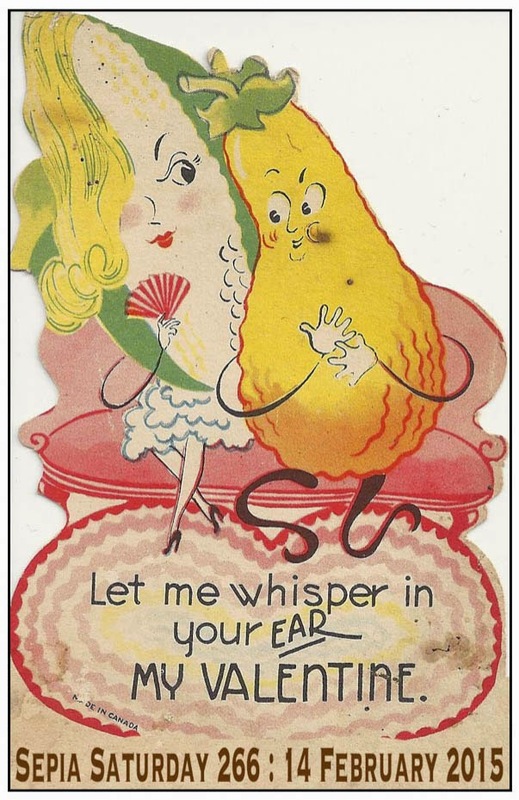 Therefore, for those in want of a theme, love is in the air this week, and if you don't like love there is that old standby, talking vegetables. All you have to do is to post your post on or around the 14th February and then add a link to the Linky List below. What could be easier, what could be sweeter .... what could be cornier! Those are for the future. This week I am concentrating on you and only you. Have I ever told you .... "roses are red, violets are blue. 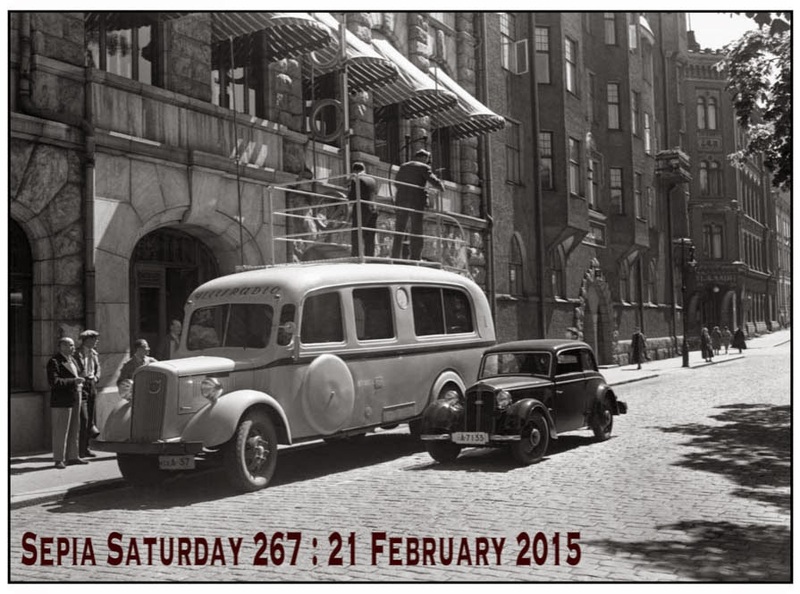 photos are sepia, look after them, do"
This week, our Sepia Saturday roadshow rolls into the Finnish city of Helsinki and makes its way to Aalto University where we are making use of their archive of old photographs which are available on Flickr Commons. In particular I have chosen this illustration from a pottery and craft class which dates back to the 1920s and is entitled "ceramic decoration". All sorts of potential themes spring to mind including pots, painting and crafts; but as always we encourage your own individual creativity to link to the image in any way you please, or - if you so wish - not at all. Just post a post on or around Saturday the 7th February and then link to the list below. Before you dash off to throw your pot, take a look at what will be spinning around in the next couple of weeks.